The district's Learn to Swim program teaches participants to swim to the best of their ability in a safe, fun and friendly environment. 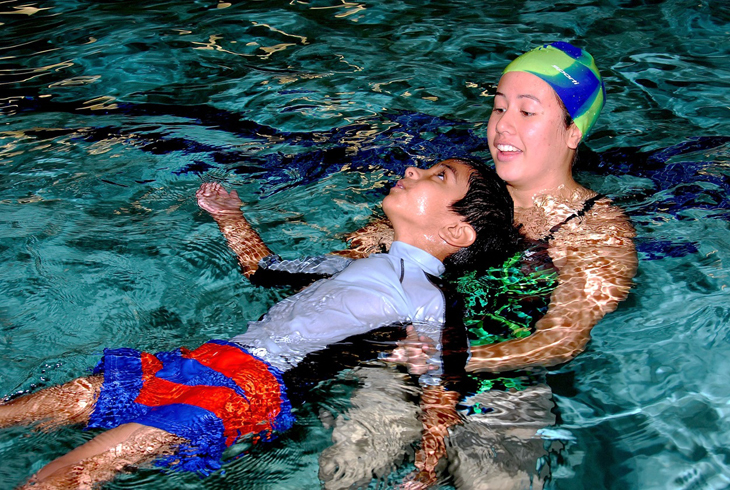 The primary goal of THPRD's Learn To Swim program is to teach all participants to swim to the best of their ability in a safe, fun and friendly environment. All classes are taught by trained water safety instructors utlitizing the same water safety guidelines taught by the American Red Cross. THPRD provides a fun and creative atmosphere to help children develop swimming skills. We believe in the value of swimming as a lifelong skill and as a healthy recreational activity, and are committed to the importance of water safety and training, for our staff as well as our community. A parent, guardian, or caregiver (at least 15 years old) must visually supervise children under 10 years old. Please do not leave the center during your child’s lesson. For children new to swimming lessons: Preschool students (age 3 through kindergarten) should begin in Preschool Level 1; School-age students (1st grade through age 12) should begin in School Age Level 1. For children who have had lessons but are new to our program: We offer free skill evaluations. Please contact your local pool to schedule an appointment. An instructor will provide an assessment based on the skills your child is able to perform. The instructor will provide you with a recommended level to register your child. For returning students: the Aquatics staff will determine where each child will be placed. No exceptions will be made. Participants may register for multiple sessions, but all sessions must be the same level. Note: Children, especially younger ones, lose their "swim conditioning" after long breaks and can benefit greatly from a review of learned skills. If your child has not taken lessons in the past three months, please re-take the most recent level, even if your child successfully advanced. Swim classes are designed to have one instructor per five preschool students and one instructor per six school-age students. Specialty classes may have different ratios. Occasionally, your child may work with two instructors in the same class. This occurs as part of our instructor training program. While providing assistance, the new instructor gains valuable experience working alongside an experienced instructor. No running on the pool deck or in the dressing rooms. Please do not allow your child to swing on the bars in the dressing room. Food is allowed in the spectator section only. No gum chewing in class. We want the instruction program to be a positive, safe and fun experience for you and your child. It is our hope that swimming will become a lifelong recreational activity for your entire family. It is not uncommon for new surroundings to be a little frightening. To reduce anxiety, give your child a tour of the dressing rooms, shower area and even show him/her the spectator section where you will be sitting during lessons. Please pull long hair back or have your child wear a swim cap. Hair in your child’s eyes and mouth makes it difficult to swim. Please take your child to the restroom prior to each class. If your preschool age child needs to go to the restroom during class, please be prepared to take them. Please remove all bandages and throw away gum prior to class. If your child is sick or has an open sore/wound, it may be best not to attend class. Showering is required before entering the pool. If you need to assist your child in the shower, please remove your shoes. Please notify your child’s instructor of any special circumstances that may affect your child’s progress. Parents are encouraged to watch their child’s class from the spectator section. Spectators are not permitted on the pool deck. Also, please enter the deck through the dressing rooms only. Some pools have specific deck entrances for staff or emergency use only. Parents must be aware of factors which cause a fearful situation as well as those that promote a positive attitude. Watch out for the use of fright words with your child. DROWN is the most common fright word. A non-swimming child who has been taught a fear of drowning is usually also afraid of the water. This is a big hurdle for the child to overcome. It is important to educate potential dangers without instilling fear. Please keep in mind that each child progresses at his or her own pace. In swimming lessons, we de-emphasize passing or failing and emphasize improvement. Each child will receive a progress card at the end of the session to let you know what your child has accomplished within the progression and what skills to practice. It is not uncommon for a child to repeat a level several times before moving on to the next level. It is important that your child is improving and having FUN! Remember to be positive! Please be on time to class. A child who is rushed often comes to class upset. It is also less disruptive to the instructor and the other students if everyone starts at the same time. Please keep in mind the instructor is only with your child for a short amount of time. We need your assistance with their lesson performance. The same holds true for effective discipline. If there is a method that works effectively for you with your child, and the instructor is not having success, they would welcome your input. If you have questions or concerns, please leave your name and phone number at the front desk and the instructor will notify you immediately following their lesson shift. Program coordinators are also available during lessons to assist you with your concerns and can serve as a liaison between you and instructors regarding communication. In the event the instructor or program coordinator cannot resolve your problem, please notify the center supervisor of the facility. We value your input and we do listen. At the end of each session, evaluation forms are available for you to complete and many centers will send them to you via the email you provided on your park district account. We want to know about your and your child's experience throughout the session. These evaluation forms are used to help us gauge the effectiveness of our program. THPRD is a local partner of USA Swimming Foundation, a national non-profit that raises funds to support programs that save lives and build champions - in the pool and life.